The fascinating tale of the Magician and the Knight. They were both profoundly attracted by Spiritualism, and yet their opinions were completely opposed. With the release, last October, of the film Fairy Tale: A True Story, devoted to the famous case of the Cottingley Fairies (Sheaffer, 1977; Randi, 1982), a new generation of cinema-goers has had a glimpse (though only in a fictional way) to the strange relationship that linked, more than seventy years ago, two most singular characters. They were Harry Houdini - master magician, escape artist and mystifier extraordinaire - and Sir Arthur Conan Doyle - author and creator of Sherlock Holmes. They were both profoundly interested in the subject of Spiritualism; however, their views differed completely. Houdini was the skeptic, the exposer of psychic frauds; Doyle the believer, the St. Paul of Spiritualism. How could these two persons have become affectionated friends and then bitter enemies is a fascinating tale which deserves telling. 3 Sitting With Eva C.
It all began in early 1920, when Houdini, touring the British Isles, sent Sir Arthur one of his books, The Unmasking of Robert-Houdin. In it, he made reference to the Davenport Brothers, two American medium-magicians who became very famous in various parts of the world, during the middle of the last century. Their specialty was the presentation of the "Spirit cabinet", a wooden cabinet in which they sat and were securely tied by means of meters of rope. No sooner had the cabinet doors been closed than rappings would be heard, a bell and a tambourine would play and hands would appear at the openings of the doors. Examination of the mediums at the conclusion of the séance, or at any time during its progress, revealed the mediums tied as before. The question was: were they genuine mediums or clever magicians, who somehow managed to free themselves from the bonds and produce the manifestations themselves? Houdini had had a chance, in 1910, to speak at lenght with Ira Davenport, the only surviving brother, and felt privileged to learn directly from him the clever secret of their act. They were forerunners of the escape act that later made Houdini famous, and Ira admitted to him that they had always used trickery; however, for publicity reasons, they let their audiences decide for themselves as to the true source of their sensational demonstrations. In thanking Houdini for the book, Sir Arthur wrote he didn't put much faith in this kind of revelations: «As to Spiritualist "Confessions," they are all nonsense. Every famous medium is said to have "confessed," and it is an old trick of the opposition». He also showed to believe in one of the oldest ruses used by fake mediums and psychics to convince onlookers of the reality of their powers (Wiseman, 1997; Polidoro, in print), namely that failure is proof of genuine paranormal powers. He wrote, in fact: «I can only learn, so far as "exposures" goes, that there were occasions when they could not undo the knots, but as there are intermittent periods in all real mediumship, that is not against them. It is the man who could always guarantee spirit action whom I should suspect most». In various subsequent letters, Sir Arthur reverts to the Davenports repeatedly, writing: «I've been reading the Davenport book you gave me. How people could imagine those men were conjurers is beyond me». And, after Houdini sent him a picture of himself with Ira: «...you said that Ira Davenport did his phenomena by normal means. But if he did (which I really don't believe) then he is manifestly not only a liar but a blasphemer, as he went round with Mr. Ferguson, a clergyman, and mixed it all up with religion. And yet you are photographed as a friend with one whom under those circumstances, one would not touch with a muck-rake. Now, how can one reconcile that? It interests me as a problem». Houdini, on his part, anxious to cultivate a friendhisp with Doyle, replied somewhat ambiguously: «I can make the positive assertion that the Davenport Brothers never were exposed», meaning, with this, that no one ever discovered their tricks. Doyle, however, preferred to interpret this as a confirmation of his beliefs, that they were never exposed because there was nothing to expose: «Unless I hear to the contrary, I will take it that I may use your authoritative statement as the occasion serves». In a further letter, Doyle went straight to the point: «I had meant to ask you, in my last, and I will do so now, whether you, with your unique experience, consider that the Davenport phenomena were clever physical tricks, or whether their claim to occult power was a true one». Houdini, again, was non-committal: «Regarding the Davenport Brothers, I am afraid that I cannot say that all their work was accomplished by the spirits». Doyle found the reply satisfying and so their friendship started. It was about this time that Houdini's most profound interest in the world of spirits developed. 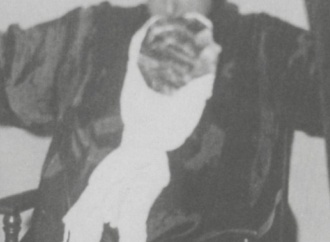 However, he presented himself to Doyle as a long-time student of Spiritualism: «I have gone out of my way for years to unearth mediums, so that I could really find a truthful representative - and regret to say that, so far, I have never witnessed a séance which had the ring of sincerity». And, in another letter: «During my tour in Australia, I met a men who was supposed to have laid low Mrs. Piper; I was in Berlin, Germany, at the trial of Miss Rothe, the flower medium; I know of the methods of the Bangs Sisters, the famous Chicago mediums; I was in court when Anna O'Delia Diss De Bar, who was mixed up with the lawyer Luther Marsh, was sentenced...» He also proposed himself to Doyle as a disciple: «You will note that I am still a sceptic, but a seeker after the Truth. I am willing to believe, if I can find a Medium who, as you suggest, will not resort to "manipulation" when the Power does not "arrive"». On April 14, they finally met at Windlesham, Doyle's country house in Crowborough, Sussex. «Visited Sir A. Conan Doyle at Crowborough», wrote Houdini in his diary. «Met Lady Doyle and the three children. Had lunch with them. They believe implicitly in Spiritualism. Sir Arthur told me he had spoken six times to his son. No possible chance for trickery. Lady Doyle also believes and has had test that are beyond belief. Told them all to me». Houdini, asked Doyle's help to find a true medium: «I am very, very anxious to have a séance with any medium with whom you could gain me an audience. I promise to go there with my mind absolutely clear, and willing to believe. I will put no obstruction of any nature whatsoever in the medium's way, and will assist in all ways in my power to obtain results». Doyle consented and arranged a number of sittings for him in London and elsewhere. My Dear Sir Arthur, Well, we had success at the séance last night, as far as productions were concerned, but I am not prepared to say that they were supernormal. I assure you I did not control the medium, so the suggestions were not mine. They made Mlle. Eva drink a cup of coffee and eat some cake (I presume to fill her up with some food stuff), and after she had been sewn into the tights, and a net over her face, she "manifested," 1st. Some froth-like substance, inside of net. It was about 5 inches long; she said it was "elevating," but none of us four watchers saw it "elevate." Committee, Messrs. Feilding, Baggally, Dingwall and myself. 2nd. A white plaster-looking affair over her right eye. 3rd. Something that looked like a small face, say 4 inches in circumference. Was terra-cotta colored, and Dingwall, who held her hands, had the best look at the "object." 4th. Some substance, froth-like, "exuding from her nose." Baggally and Feilding say it protruded from her nose, but Dingwall and I are positive that it was inside of net and was not extending from her nose; I had the best view from two different places. I deliberately took advantage to see just what it was. It was a surprise effect indeed! 5th. Medium asked permission to remove something in her mouth; showed her hands empty, and took out what appeared to be a rubberish substance, which she disengaged and showed us plainly; we held the electric torch; all saw it plainly, when presto! it vanished. The séance started at 7.30 and lasted till past midnight. We went over the notes, Mr. Feilding did, and no doubt you will get a full report. I found it highly interesting. After receiving this letter, Sir Arthur wrote to Houdini: «That is very interesting. It is certainly on the lowest and most mechanical plane of the spiritual world, or borderline world, but at least it is beyond our present knowledge». Houdini, however, did not reveal immediately to Conan Doyle his further thoughts on the séance. In fact, in private he noted: «I was not in any way convinced by the demonstrations». A few years later, in his book A Magician Among the Spirits, he explained that he had detected the various tricks employed. He believed, for example, that the dissapereance of the rubbish substance had been accomplished by sleight of hand: «I know positively that the move she made is almost identical with the manner in which I manipulate my experiment» (he was referring to the "Hindu needle trick"). In conclusion, he felt that Eva and her assistant Mme Bisson, were subtle tricksters: «I have no hesitation in saying that I think the two simply took advantage of the credulity and good nature of the various men with whom they had to deal». It was about this time that Doyle became engaged in the story of the fairy photographs. He wrote to Houdini: «I have something far more precious: two photos, one of a goblin, the other of four fairies in a Yorkshire wood. A fake! you will say. No, sir, I think not. However, all inquiry will be made. These I am not allowed to send. The fairies are about eight inches high. In one there is a single goblin dancing. In the other four beautiful, luminous creatures. Yes, it is a revelation». It is, however, interesting to note that Houdini had no comment to make on this subject in any of his letters: perhaps because he could not bring himself to discuss it seriously. Meanwhile, Sir Arthur was getting more and more convinced that Houdini himself did actually have some kind of supernatural powers. «I have heard of your remarkable feat in Bristol», he wrote Houdini. «My dear chap, why go around the world seeking a demonstration of the occult when you are giving one all the time? Mrs. Guppy (a well-known medium) could dematerialize, and so could many folk in Holy Writ, and I do honestly believe that you can also,- in which case I again ask you why do you want demonstrations of the occult? My reason tells me that you have this wonderful power, for there is no alternative, tho' I have no doubt that, up to a point, your strenght and skill avail you... I am amused by your investigating with the S.P.R. Do they never think of investigating you?» In April of 1922, Sir Arthur went to the United States for a series of lectures on Spiritualism. They created a sensation and lecture halls were Doyle was appearing were always filled to capacity. His opening lecture at Carnegie Hall, in New York, had to be repeated seven times to satisfy all those interested. Houdini attended one of the lectures but did not discuss it with Doyle. Instead, the two men met about a month later, on May 10, when Sir Arthur and his wife went to New York to have lunch at Houdini's house. Houdini showed his huge collection of books on magic and related arts to Sir Arthur, who was duly impressed but noticed the lack of «good books» on Spiritualism, that is in favor of it. In a memorandum, Houdini noted later that day: «There is no doubt that both Sir Arthur and Lady Doyle believe absolutely in Spiritualism, and sincerely so. They related a number of incidents which they accepted without proof. They stopped for lunch and we enjoyed the visit very much. Lady Doyle passed a comment that this was the most home-like home that she had ever seen. After luncheon we called a car and took them to the Ambassador Hotel». While in the car, Houdini showed Doyle a very childish trick, the apparent removal of the first joint of his thumb. The reaction of Doyle to this is quite exemplary of his naivité: «Just a line to say how much we enjoyed our short visit yesterday. I think what interested me most was the little "trick" which you showed us in the cab. You certainly have very wonderful powers, whether inborn or acquired». I walked with Sir Arthur to the Doyle's suite. Sir Arthur drew down the shades so as to exclude the bright light. We three, Lady Doyle, Sir Arthur and I, sat around the table on which were a number of pencils and a writing pad, placing our hands on the surface of the table. Sir Arthur started the seance with a devout prayer. I had made up my mind that I would be as religious as it was within my power to be and not at any time did I scoff at the ceremony. I excluded all earthly thoughts and gave my whole soul to the seance. I was willing to believe, even wanted to believe. It was weird to me and with a beating heart I waited, hoping that I might feel once more the presence of my beloved Mother... Presently Lady Doyle was "seized by a Spirit." Her hands shook and beat the table, her voice trembled and she called to the Spirits to give her a message. Sir Arthur tried to quiet her, asked her to restrain herself, but her hand thumped on the table, her whole body shook and at last, making a cross at the head of the page, started writing. And as she finished each page, Sir Arthur tore the sheet off and handed it to me. I sat serene through it all, hoping and wishing that I might feel my mother's presence. The first sheet began: «Oh, my darling, thank God, thank God, at last I'm through. _ I've tried, oh so often-now I am happy. Why, of course, I want to talk to my boy-my own beloved boy-Friends, thank you, with all my heart for this». It continued on the same tone for fifteen pages. After the séance was over, Houdini asked about trying automatic writing at his own home, took a pencil and wrote the name "Powell". Doyle was shocked, for a friend of his by that name, the editor of the Financial Times; of London, had died about a week previously. 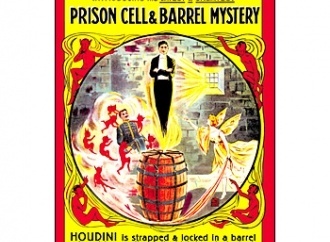 For Doyle it was further proof that Houdini himself was a medium: «Truly Saul is among the Prophets». When Houdini and Doyle parted, that evening, they had already formed two very different opinions of what had happened. According to Doyle, Houdini left «deeply moved» and, when they met two days later in New York, remarked: «I have been walking on air ever since». Houdini's account, however, was much different. There were various details which could not be reconciled with what he knew about his mother. «Although my sainted mother had been in America for almost fifty years», he wrote, «she could not speak, read nor write English», and Lady Doyle's message was in perfect english. Also, her message began with the sign of a cross: hardly, the wife of a rabbi would have communicated such a symbol. Furthermore, Houdini had kept on thinking all the time about familiar things that he had always discussed with his mother, he expected some reference to them in the message. There was none, as there was no reference either to the fact that the day before the séance, June 17, was the birthday of Houdini's mother. Houdini did not reveal to Doyle all his doubts about the séance, for the moment; however he protested Doyle's casting him as a medium. Regarding the "Powell" incident, in fact, Houdini explained that he was referring to a magician friend, Frederick Eugene Powell, with whom at the time he was having a great deal of correspondence. «No, the Powell explanation, won't do», was Sir Arthur's immediate reply. «Not only is he the man who would wish to get to me, but in the evening Mrs. M., the lady medium, got "there is a man here; he wants to say that he is sorry he had to speak so abruptly this afternoon." The message was then broken by your mother's renewed message, and so we got no name. But it confirms me in the belief that it was Powell. However, you will no doubt test your own powers further». Before returning to England, Doyle received an invitation from Houdini: «Mrs. Houdin and I are going to celebrate our twenty-eight marriage anniversary June 22nd. Would you care to join us in a little box party?» He did, so they went to see Raymond Hitchcock starring at the Carroll Theater in Pinwheel, «a hodge-podge of good-natured stuff». During the performance, Hitchcock called the attention of the audience to the presence of the two distinguished guests. Then, he asked Houdini to do a little stunt. Backed by Sir Arthur and by the whole audience yelling his name, Houdini reached the stage and performed the "Hindu needle trick", in which he apparently swallowed a quantity of needles, some thread and then brought up the needles threaded. «Seldom», wrote one reviewer the next day, «has there been heard such applause as that with which Houdini was greeted at the conclusion of the mystery. He finally made his way to his seat, but, with the audience speculating on the mystery, the Pinwheel performance was curtailed and the show swung into its closing number. Such an incident is unique, for... (there is) no mention, in the memory of the theatrical historian, of the feat of an artist not only stopping but curtailing a show in which he was not programmed to have a part». Doyle finally left America with Houdini's telegram in his pocket: «Bon Voyage. May the Decree of Fate send you back here soon for another pleasant visit». The decline of Houdini and Conan Doyle's friendship started when Houdini published an article in the New York Sun, in October 1922, in which he emphatically stated that he had «never seen or heard anything that could convince me that there is a possibility of communication with the loved ones who have gone beyond». To this Sir Arthur, evidently hurt by Houdini's statement, which obviously implied that Lady Doyle's séance too had been a fiasco, replied: «I felt rather sore about it. You have all the right in the world to hold your own opinion, but when you say that you have had no evidence of survival, you say what I cannot reconcile with what I saw with my own eyes». And concluded: «I don't propose to discuss this subject any more with you, for I consider that you have had your proofs and that the responsibility of accepting or rejecting is with you». Houdini, never one to shy away from a challenge, replied: «You write that you are very "sore." I trust that is not with me, because you, having been truthful and manly all your life, naturally must admire the same traits in other human beings». He then went on to explain all of his doubts concerning the seance and trusted Doyle would «not harbor any ill feeling». «I know», he stated, «you treat this as a religion, but personally I cannot do so for, up to the present time, and with all my experiences, I have never seen or heard anything that could really convert me». Their private quarrel soon became a public battle. Early in 1923, Houdini had become a member of the Scientific American committee to investigate mediums, a fact that had left Conan Doyle puzzled: «...you can't sit on an impartial Committee... It becomes biased at once». Later he expressed his opinion publicly: «The Commission is, in my opinion, a farce, and has already killed itself. Can people not understand that "psychic" means "of the spirit," and that it concerns not only the invisible spirit or the spirit of the medium, but equally those of every one of the Investigators?» In April, Doyle returned to the States to continue his lecture tour and, in Denver, he met Houdini. They had long discussions about Spiritualism and some recent psychic investigations. Doyle had witnessed a demonstration by the Zancig, a couple of vaudeville mind-readers, and was convinced they were real telepaths. Houdini, however, knew them personally, they were acknowledged magicians and members of the Society of American Magicians, but nothing of this moved Doyle. «Sir Arthur said that he was capable of detecting trickery», wrote Houdini in his notes, «and we had a discussion in which I said that I did not think he could. He looked amazed at me, and I said, "Why, every once in a while I see something I cannot account for"». While staying in Denver, the local newspaper interviewed Doyle; the reporter told him that Houdini was offering five thousand dollars for any medium's feat he could not duplicate, and Doyle said that he would give the same amount of money if Houdini could «show me my mother». 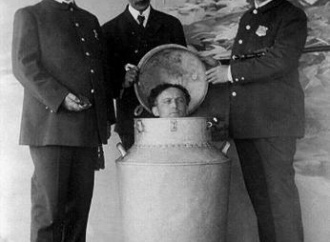 Immediately, Doyle apologized to Houdini, saying he had been misquoted. Next, it was Houdini's turn to be misquoted by a Los Angeles newspaper. After reading the interview, in which tipically Houdini stated his views on Spiritualism, Doyle wrote to him: «I have had to handle you a little roughly in the Oakland Tribune, because they send me a long screed under quotation marks, so it is surely accurate. It is so full of errors that I don't know where to begin...I hate sparring with a friend in public, but what can I do when you say things which are not correct, and which I have to contradict or else they go by default?». In a subsequent letter, Doyle further explained: «I am very sorry this breach has come, as we have felt very friendly towards Mrs. Houdini and yourself, but "friendly is as friendly does," and this is not friendly, but on the contrary it is outrageous to make such statements with no atom of truth in them». The breach was growing larger and larger; in another letter, Doyle remarked: «Our relations are certainly curious and are likely to become more so, for so long as you attack what I know from experience to be true, I have no alternative but to attack you in return. 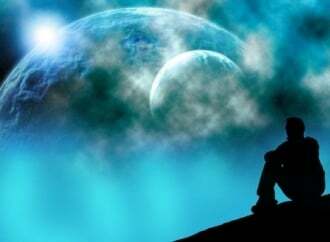 How long a private friendship can survive such an ordeal I do not know, but at least I did not create the situation». The last letter which passed between them was written in february 1924 by Doyle. In reply to some request by Houdini for some kind of information, Sir Arthur wrote: «You probably want these extracts in order to twist them in some way against me or my cause». Some time later, Houdini sent a short note inquiring whether Doyle wanted to receive a copy of his new book, A Magician Among the Spirits, but got no answer. Their friendhisp was over, but their quarrels would continue. In the summer of 1924, the biggest thing in psychical research was a new medium, powerful as well as attractive, whose name was "Margery" (Mina Crandon). She had entered the Scientific American competition and was considered to be the likeliest winner of the prize. At least, until Houdini sat with her. In fact, he was immediately able to discern her true methods and promptly revealed them to the world. Sir Arthur, who had met Margery and had endorsed her powers, considered Houdini's reveleations trash and wrote a newspaper article to tell the story of the investigation based on Dr. Crandon's, Margery's husband, correspondence on the subject. The article was meant to discredit Houdini: «It should be the end of him as a Psychic Researcher», he wrote Crandon, «if he could ever have been called one». When the article was published, Houdini announced that he would «contemplate legal action» against Sir Arthur for slander: «There is not a word of truth in his charges against me», he told a newspaper, «Sir Arthur has been sadly misinformed. Anyhow, I fail to see how he, being 3500 miles away, quilifies as a judge». He attributed the sharpness of Doyle's attack to his being «a bit senile... and therefore easily bamboozled,» and to a desire of revenge, since he had «often expressed the belief that Lady Doyle was not a valid medium». Doyle replied to Houdini's statements by diagnosing an «abnormal frame of mind» that he called «Houdinitis,» one of whose symptoms was the belief «that manual dexterity bears some relation to brain capacity». What had started as a beautiful friendship, nourished by mutual respect and admiration, ended in sharp words and threats of legal actions. When Houdini died, on 31st October 1926, however, Doyle put the ill feelings aside and expressed fondness and shock: «I greatly admired him, and cannot understand how the end came for one so youthful. We were great friends... We agreed upon everything excepting spiritualism». In a letter to Beatrice Houdini, Doyle wrote her: «Any man who wins the love and respect of a good woman must himself be a fine and honest man», and went on to describe Houdini as «a loving husband, a good friend, a man full of sweet impulses». «Who was the greatest medium-baiter of modern times? Undoubtedly Houdini. Who was the gratest medium of modern times? There are some who would be inclined to give the same answer». This is the incipit of "The Riddle of Houdini", an essay by Sir Arthur Conan Doyle published on the July 1927 issue of the «Strand Magazine» and, later, included in Doyle's last book The Edge of the Unknown (1930). The essay opened describing Houdini's many merits: Let me say, in the first instance, that in a long life which has touched every side of humanity, Houdini is far and away the most curious and intriguing character whom I have ever encountered. I have met better men, and I have certainly met very many worse ones, but I have never met a man who had such strange contrasts in his nature, and whose actions and motives it was more difficult to foresee or to reconcile. Is it not perfectly evident that if he did not deny them his occupation would have been gone for ever? What would his brother-magicians have to say to a manwho admitted that half his tricks were done by what they would regard as illicit powers? It would be "exit Houdini." This was one of Doyle's last works. In one of his last letters, to B. M. L. Ernst, Houdini's lawyer, Sir Arthur wrote: «I write this in bed, as I have broken down badly, and have developed Angina Pectoris. So there is just a chance that I may talk it all over with Houdini himself before long». On July 7, 1930, four years after the death of Houdini, the arch-skeptic, Sir Arthur Conan Doyle, the extreme believer, died. Doyle, A. C. 1930. The Edge of the Unknown. Reprint: 1992, New York: Barnes & Noble, Inc.
Ernst, B. M. L. and Hereward C. 1932. 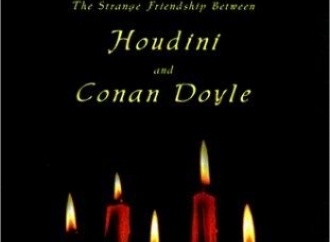 Houdini and Conan Doyle The Story of a Strange Friendship. New York: Albert and Charles Boni, Inc.
Houdini, H. 1924. A Magician Among the Spirits. Reprint: 1972, New York: Arno Press. Polidoro, M. (in print). It's all in the mind. In Neuromithology, edited by S. Della Sala, Chichester, Sussex: John Wiley & Sons Ltd.
Randi, J. 1982. Flim-Flam! Buffalo, NY: Prometheus Books. Sheaffer, R. 1977. Do Fairies Exist? In Skeptical Inquirer, vol. 2, no. 1, pp. 45-52. Silverman, K. 1996. Houdini!!! The Career of Ehrich Weiss. New York: Harper Collins. Summer, E. 1995. Conan Doyle's Revenge. In Skeptical Briefs, vol. 5, no. 4, pp. 1-2. Wiseman, R. 1997. Deception & Self-Deception. Buffalo, NY: Prometheus Books.